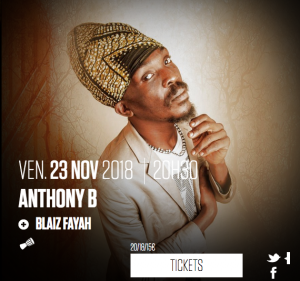 Nu-Roots Jamaican artiste Anthony B will perform live at Le Forum in Vauréal, France on the Friday, 23rd of November, 2018. The French Reggae Dancehall artiste Blaiz Fayah will open the show. Those who have missed his show in Paris on October 5th, 2018, will have a second chance to see him. Make sure you don’t miss him once again. Buy your tickets on Digitick now!